Growing Together seeks to create safe, welcoming spaces for New Americans to build relationships in Fargo. They also want to increase New Americans’ access to nutritious food. Organizers sought feedback on their idea from New Americans before initiating the program, and what they grow is partially based on the preferences of the participants. Organizers meet once a month during the offseason to plan. During the growing season, gardening takes place every day except Sunday at one or more of the gardens. Cooperating landowners provide water, land, and liability insurance, which greatly lowers the cost of the program. Our Story: "We needed to make it feel like a community, not a charity." 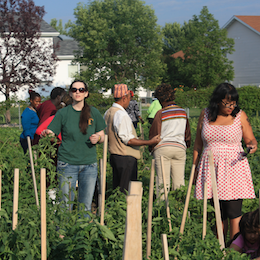 Growing together is a community garden program in Fargo, ND that began in 2006. A group of Fargo residents came up with the idea as a way to create a safe space for New Americans that welcomes them in to new community relationships. People coming to the United States as refugees have lived through situations that created great stress in their lives. Many of them have a background in agriculture, or were used to having their own gardens. The initial organizers reached out to a small group of New Americans, who affirmed interest in the idea of gardening. Growing Together started with a small garden with eight families. The first year garden blended shared and family plots. Before long, the organizers changed to communal gardens where everyone works together; today, they have expanded to six gardens, coordinated by forty-fifty volunteers. We needed to make it feel like a community, not a charity. At first, many participants were single mothers from Liberia, but as the project grew it pulled in people from many different places. As of summer 2015, about 70% of the participants are originally from Bhutan. Other gardeners include long-term residents, as well as New Americans originally from Iraq, Somalia, Rwanda, Liberia, and many other countries. Four of the Growing Together gardens accept anyone who wants to join in. The two exceptions focus on serving more specific groups: the Community Homes garden is only open to residents of neighboring apartments, while the Elder Garden is tended by a group of Bhutanese elders. The gardens run on a regular schedule, such that participants tend each particular garden at a given time and day of the week. Volunteers keep track of what chores need to be completed each week and make sure everyone has tools as needed. If participants show up early, they can harvest plants they like to eat or use for herbal medicines, but that others would consider “weeds,” before they are pulled up. When vegetables are ready, everyone harvests together, while the organizers set up to distribute shares. Each family receives one share for every two family members who participate. One family member helps to distribute vegetables, while the other gets a number based on the amount of work they have done in the garden. Participants line up based on their numbers, and go through the line to choose the vegetables they want. In addition to work on the gardens, Growing Together provides peanut butter and jelly sandwiches at the garden they work at on Thursdays. They also organize a few yearly parties outside of the growing season, including a Christmas party. They have also held occasional events to teach participants how to use unfamiliar vegetables such as zucchini. During the growing season, one of the organizers, Jack Woods, sends out an email update to a list of participants, which includes 250 people. An active Facebook page keeps a large group of friends and supporters informed about the latest chores, harvests and celebrations. Organizers meet together once a month in the offseason to plan for the next growing season. The program does not have 501(c)(3) status, and, while they have received some small grants and donations, they do not pursue large grants. They save their own seeds, rather than buying seeds. One of the organizers, Jack Woods, starts many seeds in his basement before planting time; the group has also been able to start seeds in a greenhouse at North Dakota State University. Initially, they received some money from Bell State Bank that allowed them to buy tools for the gardens. Since the collaborators who own the land pay for water, liability insurance, the group need not seek much outside funding for operations. Two of the gardens are on Fargo Parks Department land, two are on Lutheran Social Services land, one is on a medical center’s land, and one is on a local church’s land. For New Americans who come from agrarian societies, gardening offers a comfortable, familiar activity. Many Growing Together participants form trusting relationships with other participants as they garden with each other, even though many start off suspicious of others. Organizers report that this program has helped to increase trust surrounding food for many participating New Americans, helping them overcome fears about accessing food, grounded in past food insecurity and experiences in refugee camps. Finally, by growing food in the gardens, some participants save up money for large purchases such as cars or freezers, and/or find they do not need to spend all of their SNAP (Supplemental Nutrition Assistance Program) benefits. Gain easy and reliable access to a water source. Create a consistent schedule of when you will garden so people know what to expect. Maintain clear organization and clear communication system. Organizers have struggled to devise an effective method for distributing harvested vegetables. They used to separate the vegetables into boxes and then pass those out, but not everyone wanted all of the vegetable varieties. They currently use a system where everyone lines up to choose by category, but worry that distributing in this way may be stressful for some participants, as it resembles experiences in refugee camps. Some people may worry about the food running out before their turn comes. Organizers have been trying to come up with a new system for food distribution. The timing of Ramadan also poses a challenge because it reduces participation among Muslim New Americans when it falls in the middle of the growing season. Due to their cooking responsibilities, Muslim women’s participation in particular falls off during the month of Ramadan.